Although, I created the Use step-out years ago as a tangle pattern, I think it works just fine in my Fun & Easy landscape, so I’m using it today. If that’s woolly thinking, I feel sheepish. NOTE: I have to apologize. When drawing the step-by-step, I wasn’t happy and started the whole thing over. I did like some of the first try, so I traced parts of it. What I wasn’t aware of, was that the scanner was picking up underlying drawing, and creating bluish shadows on my new drawing. I cleaned it up some, but it’s impossible to get rid of it all. I loves all of you, but not enough to redraw the step-out a third time! Supplies: Pen and paper. Pencil and eraser recommended. I recommend drawing things in with pencil. I used a Pigma Micron PN because it is waterproof, so I can paint or color marker over this later if I wish. I used a good quality paper but it wasn’t necessary. Resources: Today I’m using the textures I presented in my Basic Textures step-wisely. I’m using the Winding and WrapAround Roads from my Three Roads step-wisely. The step-outs used are Basic Bush, Big Rocks, Grass Tufts, Hummingbird, Petal Plant, Popcorn Leaves, Lavender Plant, Sun Arrows and Use. Before I get to the nitty gritty, I’m adding some definitions of terms I’m using and an explanation of the choices I made in drawing this first example. I think the info is valuable, but if you don’t like reading a lot, or don’t have time, 0just scroll down to where it says step-by-step. When you look at drawing and just feel something is wrong, it is often the composition that makes you uneasy. Knowing a little about this subject will help you make decisions, and to understand when you’ve made a decision that you don’t want to repeat. Interest: The appeal an object has for most viewers. People are more likely to look for, study and remember a face than a rock. Therefore a face has more ‘interest’. Textures, values, size, numbers and shapes all add interest. It’s a little bit like rock, paper, scissors. A group of rocks would be more interesting than a single rock. But a rock with texture, larger size or unusual shape might be more interesting than a group of rocks. A squirrel (which has a face) would be more interesting than a rock, but a huge rock might be more interesting than a tiny squirrel. Focal Point/Focus: The area or object in your drawing that pulls the viewer’s eye first when they look at your drawing. There should be one main focal point, and then lesser focal points to help the eye move around the drawing (see flow). Values: Value is a term in art that refers to a scale of light to dark. You should have at least three values – light, medium and dark, but will probably have more. High contrast between light and dark adds more interest and can create a focal point in your drawing. Weight: The combination of interest and values creates weight. The area of your drawing with the most weight becomes the focal point. Lesser areas of weight help guide the eye around the drawing. A drawing with equal weight through-out seems flat and uninteresting. Flow: When someone looks at a drawing, their eyes move around, picking out detail. Drawings with clear focal points and balanced weight help them decide how to travel through the work almost like there were arrows directing them to go here next. Composition: The placement of all the elements of a drawing, including interest, weight, values, focal points, and flow in a drawing (or any art for that matter). Composition is a subtle and complex thing. Even experienced artists who can draw the most beautiful objects may be dissatisfied with their work because the composition is not good. If you read the glossary above, you know that weight is used to help the eye flow through the drawing. I’ve tried to establish a zig-zag flow moving the viewer from the bottom left to the upper right. I loaded the weight in the lower left the largest sheep, the most contrast and the clearest face. I added some texture, rocks and grass tufts to create a group of things that were low interest, thus adding interest in the area without competing with the sheep. 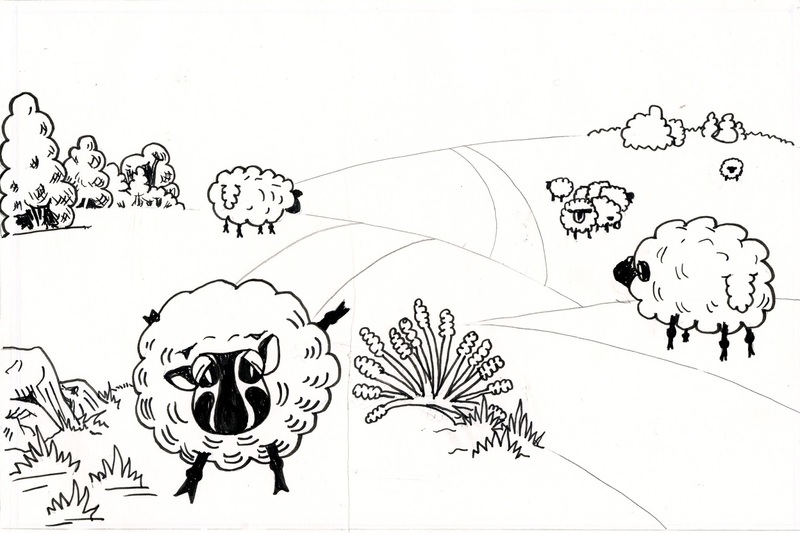 On the right, the Popcorn Tree and plants are a group with almost the same overall value as the sheep, but there is less contrast. The tree is larger, but most people will find the sheep more interesting and interest adds a lot weight. 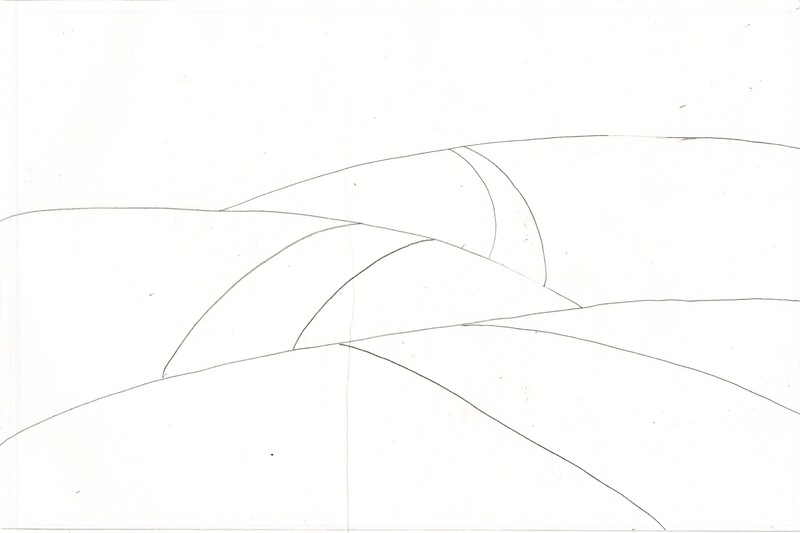 However, the way the tree is leaning should also lead the eye to medium left section of the drawing. 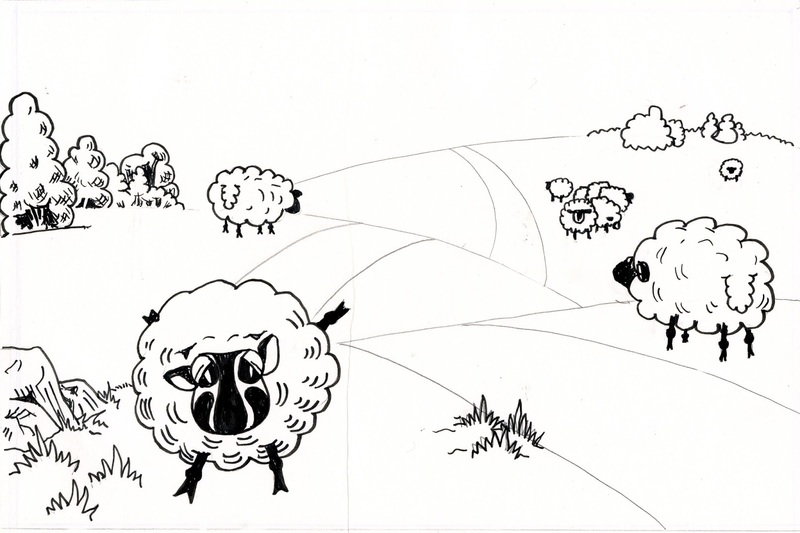 To help increase the flow even more, I drew a couple of sheep standing away from the flock. Those two sheep help the eye cross over the road yet keeps the road in sight. In the mid-ground left, the number of sheep adds weight to this section. The eye may rest here for a few seconds, because the value hasn’t changed much and the background has low levels of interest. That isn’t a bad thing. If the eye isn’t allowed to rest, the brain may feel the drawing is too busy. However, while those trees are low level interest, they also have the largest change in value, so the eye will go there and feel they’ve reached the end. The texture throughout is also important. In the foreground the scribbling is darker and covers more ground. 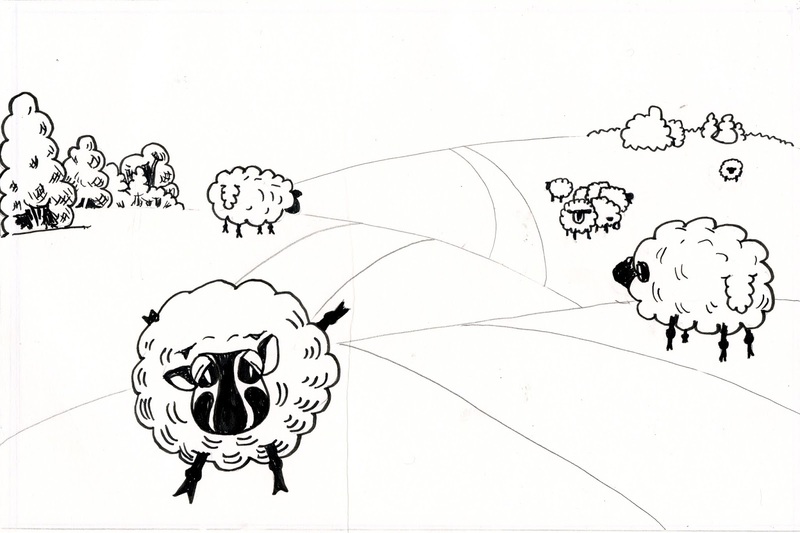 In the midground, the scribbling brings the focus to the sheep, but the texture of the sheep’s fur is less distinct. In the background the trees have little to no texture. The texture on the ground changes from the scribble to line hatching. Overall, both texture and detail grow less as distance increases. This not only leads the eye, but gives the brain information about the amount of depth in the drawing. The road and the white space also add to the flow and sense of depth. They follow a gentler zig-zag pattern that similarly leads the eye and if the drawing is reduced in size, or from a distance, it will be more dominate than the weight and values. Now, I’m going to walk you through a step-by-step where I’ve done things a bit differently. I’ve based my choices on things that I felt could be improved from the first example, and also made some choices simply to expand on my points. 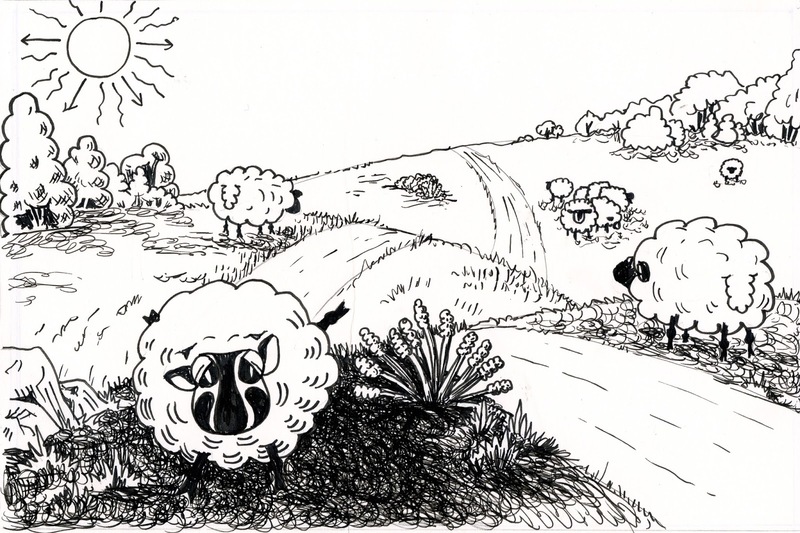 I drew my first sheep and she’s a lively one. This creates more interest, thus more weight. I want people to leap to the right, but I decided to go a different route from the trees and plants because I felt the tree was too tall for this layout. 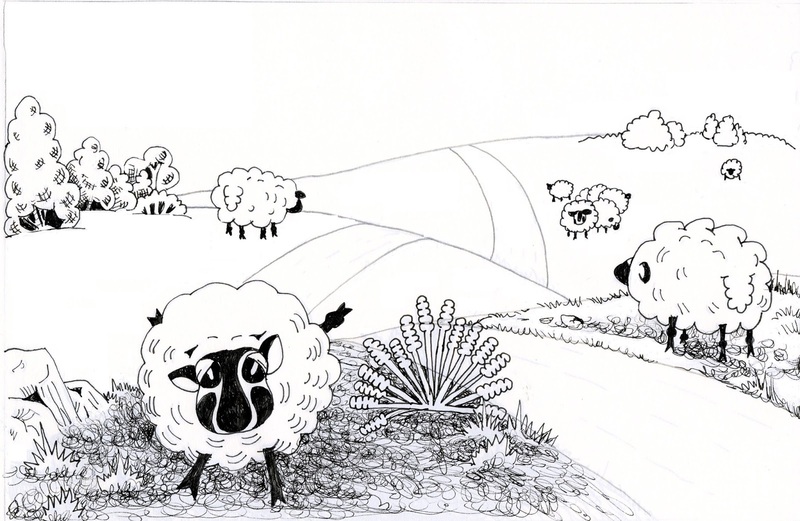 My second sheep is facing away, making her less interesting than the first sheep, but also pointing towards the area I want the viewer to look. 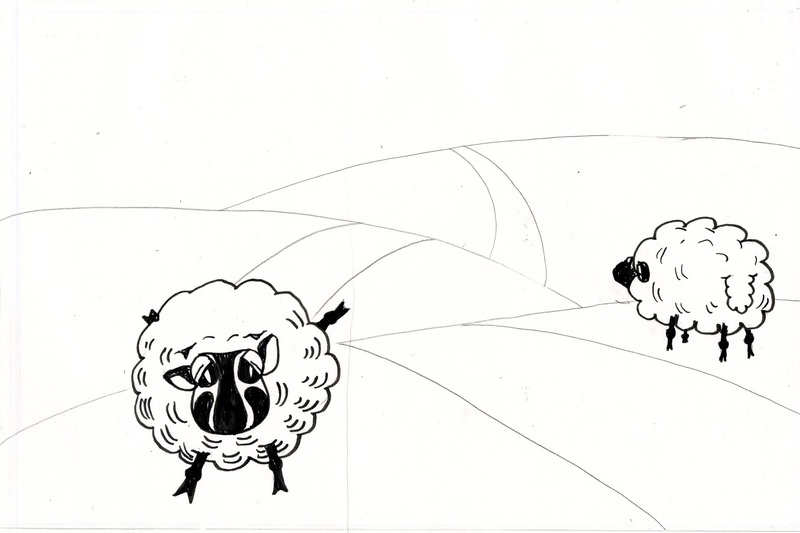 I liked the idea of the sheep facing away, and decided to repeat it for the next section. (If anyone needs it, I can do a step-out for that looking-away sheep). Before deciding what I wanted on the next hill, I felt I needed to establish a bit more weight in the midground. I used the Basic tree step-out. 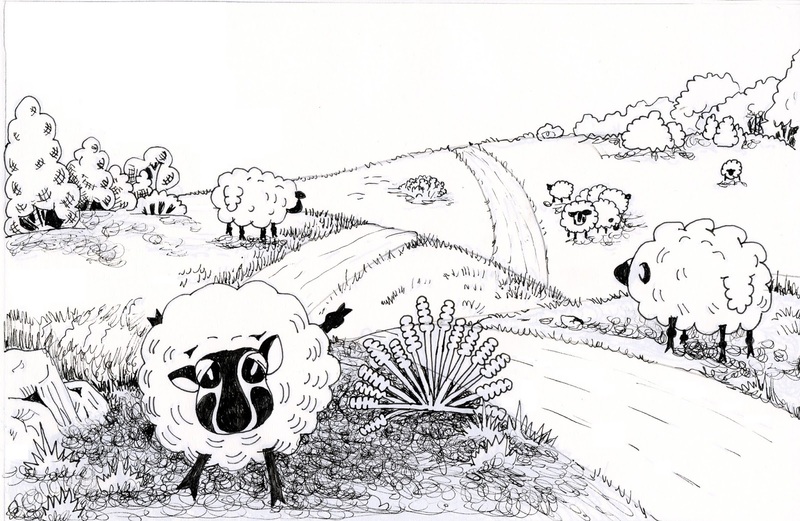 I wanted those trees to echo the sheep, yet be different, so I added the branches and dark sections at the bottom, but changed the texture to cross-hatching for the foliage. 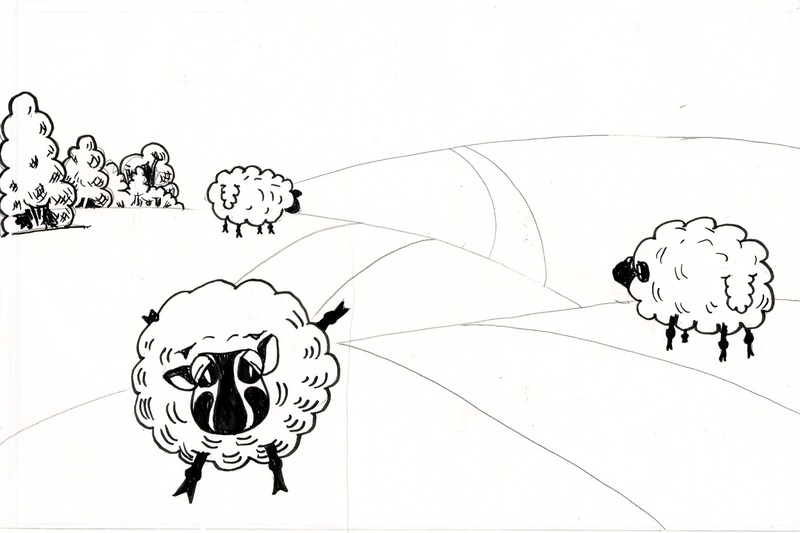 I put my flock of sheep in the far mid-ground, reducing the number and decreasing the amount of detail. You can’t even really make out their faces. This increases the weight of the first sheep, because she is the only one with a really clear face. I added a few basic trees with no shading on the right. 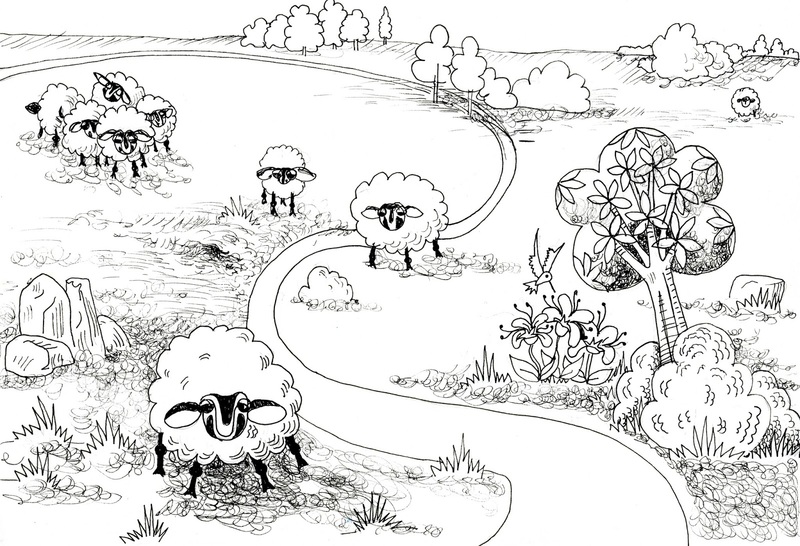 Between the flock and the tree shapes, I put one lone sheep with virtually no detail. It could even be a bush. It acts as a bridge to further lead the eye toward those tree shapes. Going back to the lower left, I added some grass tufts and rocks. I used curled line to show the facets of the rocks, and straight (hatched) lines to show where the rock is flat. I put some grass tufts near the edge of the road to lead the eye that way. The grass tufts didn’t feel like enough, so I added a lavender plant. the scribbling is darkest where it meets something – the fur of the sheep, the edges of the lavender plant, etc. 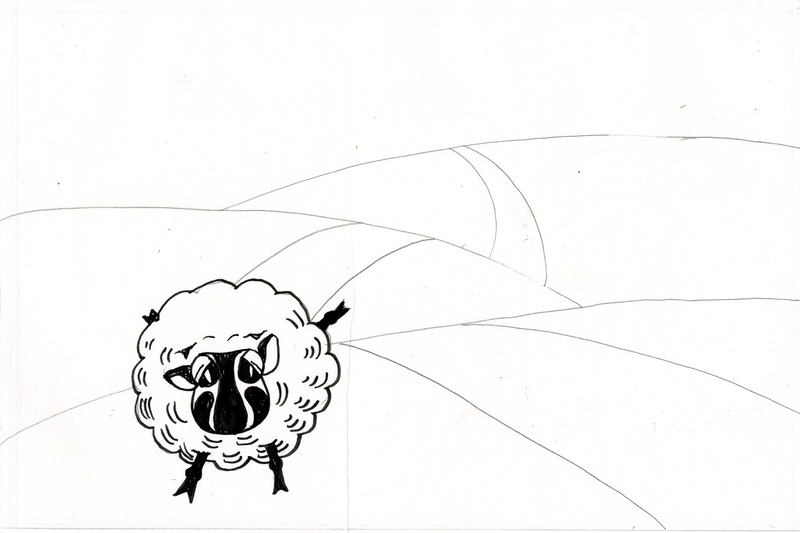 I darkened areas beneath the sheep to imply shadows (but not as dark as where edges meet). At the bottom, where the road starts. I lessened the scribbling to imply a slope in the ground. Darkening the values around the fur and plant increase contrast. Things like the slope in the ground are fussy details, that can increase interest, but could also crowd the drawing. If you are dissatisfied with a drawing, look for the fussy details. If you work seems crowded, eliminate them. If it seems to empty try to add some. Remember though, usually less is more. NOTE: Here’s where my scanner started picking up details from my first drawing, creating a bluish cast and darker value. Sorry about that! In the left mid-ground I added weight with texture. I used lines to resemble distant grass, and a more open and lighter scribbling for ground cover. Notice that I did NOT darken around the fur or trees. I wanted to keep the contrast less. In the far mid-ground I added something that could be a lavender plant, but could be a rock. I scribbled some shadows around the flock and the trees. I felt it wasn’t enough, so I added more trees with minimal detail. To finish up, I added some line texture to the roads. Now I want to show you something extra. I’ve been yapping on about values and contrast and also pointing out possibilities to look at when you are unhappy with a drawing. So here’s a version with values in the fore-ground that I think are much too dark. Compare it with the first example (lightest contrasting values) and the finished step-by-step (medium contrasting values) and see what difference those values make. If you are unhappy with a drawing take a close look at the values you’ve created. This is probably the source of most frustration for beginners (and advanced artists as well, to be honest). I’d like to know what’s working for you, so please feel free to comment. Too talky? Confusing? What do you like specifically (that really helps to know! ).